Karl Joseph was counted on from day one by the West Virginia Mountaineers to anchor their secondary. 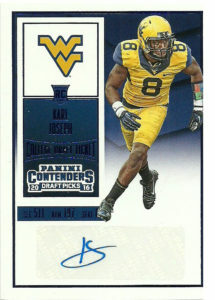 In his Freshman year of 2012, he put up 104 tackles, and generally was counted on to be an enforcer for much of his first 3 years playing for WVU. During his Senior year he led the NCAA in interceptions (5) before a knee injury ended his season prematurely. With the 14th pick overall in the 2016 NFL Draft, the Raiders selected Joseph to help address the depth on the backend of their defense. He made 10 starts in his rookie season, recording an interception, 6 passes defensed, 51 tackles, and a fumble recovery. 2018 was a tumultuous season for the Raiders with many key pieces of the team being traded to other teams. Karl was no exception, but after turning in a decent 2017 from free safety with 79 combined tackles and an interception, he turned it up a notch in 2018 and really started playing his best ball during December. While the jury is still out on if he’s on the outs after the season concludes, no one can say Joseph didn’t show up in the end. This is a stunning card. I love the color combination and the photo composition. His name is in a reflective foil, barely able to be made out of the scan, but overall, this is a great set. 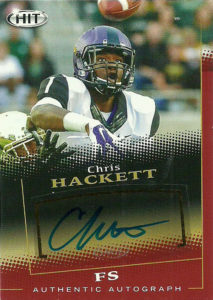 Chris Hackett played for the TCU Horned Frogs from 2012-2014 at defensive back and safety. His best season came in 2014, when he posted 75 total tackles, 2.5 tackles for loss, 6 passes defended, and 7 interceptions for 131 yards. 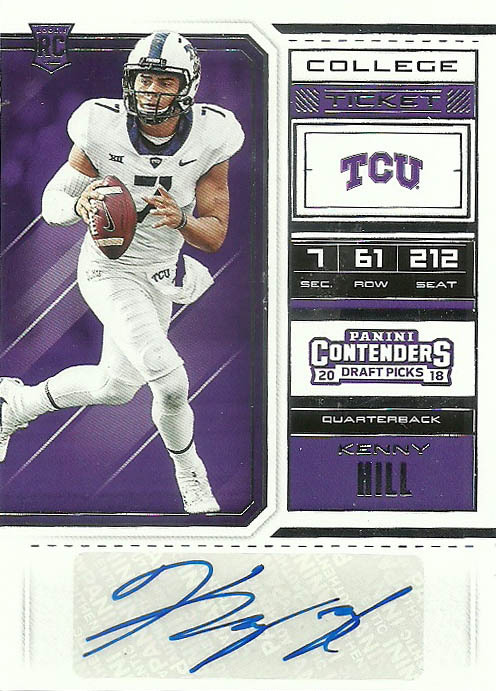 Over his career at TCU he posted 224 total tackles, 8.5 tackles for loss, 11 passes defended, 1 fumble recovery, and 12 interceptions for 154 yards. Chris declared early and headed to the NFL. Scouts were mixed about his talent at the next level, and an unimpressive combine sealed his fate. Hackett was not selected in the 2015 NFL draft. He’d sign with the Tampa Bay Buccaneers but was released during final cutdowns. Later that year, Hackett was signed by the Oakland Raiders to their practice squad. He’d be released during the 2016 preseason. Currently he’s a free agent.